Ferrero recognizes the need for proper enforcement mechanisms to sanction or amend advertisements that do not meet the above mentioned self-regulatory requirements. Ferrero believes that an effective self-regulation of commercial communications provides a valuable framework to best serve the consumer’s interest in receiving truthful and accurate communications. This is why Ferrero, individually as well as through the Associations to which it belongs (such as WFA, the World Federation of Advertisers, and IFBA, the International Food & Beverage Alliance), is an active player in the self-regulatory process at national, as well as international level. Within Canada, Ferrero is an active participant in the self-regulatory process through Advertising Standards Canada (ASC). 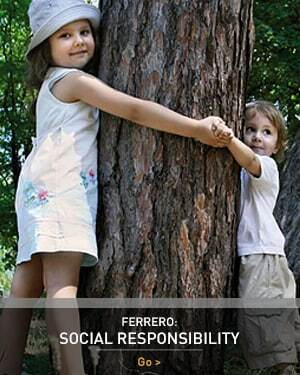 Ferrero has always believed in the crucial role played by parents in educating their children to a balanced diet and a healthy and active lifestyle. Therefore, advertising & marketing communications concerning our food products are directed primarily to the adults who make the household purchasing decisions. In line with the above considerations, Ferrero is committed to applying the “Global Policy on Marketing & Advertising to Children” defined by the International Food & Beverage Alliance (IFBA), of which we are a member. In line with such IFBA policy, Ferrero Canada is committed to the Canadian Children’s Food & Beverage Advertising Initiative (Children’s Advertising Initiative).